1. To understand the use of Experimental controls such as KNOWNS to test laboratory technique and arrive at a controlled answer so that an unknown may be tested. 2. To analyze two unknown solutions through controlled experiments. 3. To observe chemical reactions going to completion through precipitation. 4. To familiarize the student with laboratory reagents. 5. To notice various solubility characteristics of various solids with various solvents. 6. To observe visible color reactions for chemical identification of various cations and anions. 7. To observe characteristic flame tests of various cations. 8. 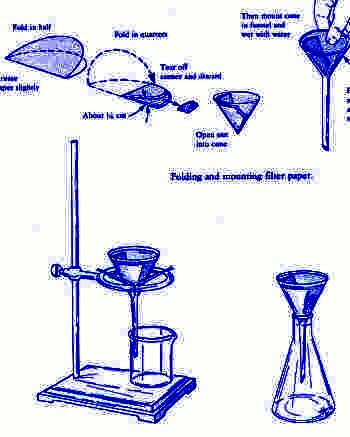 To manipulate a funnel and filter paper, so that the student will be able to separate a solid (precipitate) from a liquid (filtrate). 9. To manipulate a centrifuge to separate solids from liquids. 10. To compare MACRO with MICRO techniques in Qualitative Analysis. 11. To manipulate a reagent bottle so that the student may pour dangerous chemicals without spilling a drop. 12. To boil water safely in a test tube. 13. To scrub glassware so as to remove chemicals and oils from the surface. QUALITATIVE ANALYSIS: Laboratory Techniques which identify the presence or absence of various anions and cations. SOLUTION: Homogeneous mixture of solute and solvent which passes through filter paper. Also cannot be separated by centrifuging. Solute and solvent are ionic or molecular in size. Always clear (never cloudy). After washing test tubes and other glassware with soap and tap water, they have to be rinsed again using deionized water. This removes any ions left on the glassware by tap water. It is not necessary to dry glassware used in qualitative analysis because deionized water will not affect any of the reactions. You should have a plastic wash bottle in your tray. Keep it filled with deionized water. Use it to rinse glassware, to add deionized water to reactions and to wash precipitates. Remember to wash and rinse graduated cylinders and pipets and stirring rods between uses. (or use the vortex mixer), centrifuge and pour the water out. PART A will be the identification of four cations using MACRO techniques. Macro techniques use large test tubes, milliliter quantities, usually using filter paper. Part B will be the identification of four anions using MICRO techniques Micro technique involves adding drops and small portions. A small test tube rack and test tubes are used which will fit a small centrifuge for separation. The physical states of the chemicals are noted in the chemical equation by writing the abbreviations (s), (l), (g), or (aq) for solid, pure liquid, gas, or aqueous (water) solution. Substances A and B are called Reactants or the subject of the sentence. The horizontal arrow reads “yields” or “produces” and is the verb of the sentence. Substances C and D are called Products or the predicate of the sentence. Most of the reactions in the next three experiments are the type of ION EXCHANGE or Double Replacement. That is, two ionic compounds exchange their ions to form two or more compounds. *The common strong acids are hydrochloric acid, nitric acid, sulfuric acid, perchloric acid, hydrobromic acid and hydroiodic acid. Assume they are 100% ionized in the aqueous solution. **Strong bases include KOH, LiOH, NaOH, Ca(OH)2 , Sr(OH)2, and Ba(OH)2 which are actually soluble salts. 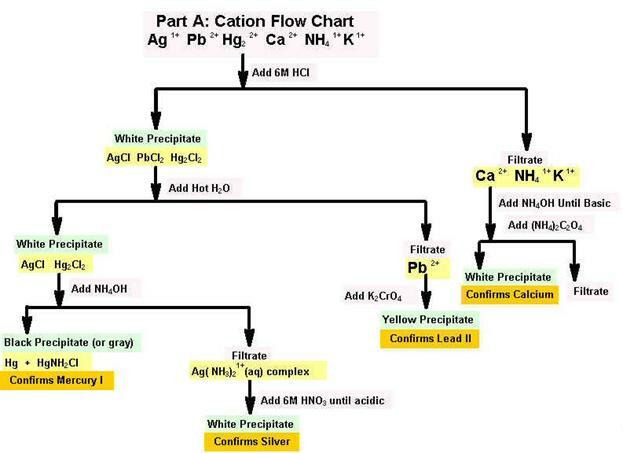 Assume all other acids and bases are weak and you do not re-write them as ions..
1. An insoluble solid is produced as a product. This called a precipitate. Above C (s) would be a precipitate. Sometimes a precipitate is shown as an arrow down C ¯. 2. A gas is released as a product. When CO2 is formed from an acid reacting with an ionic carbonate or bicarbonate compound, the gas bubbles from the solution. When Ammonia gas, NH3 is formed it doesn’t bubble, but oozes from the solution and you can smell it. Many times a gas evolves which is odorless, but a reaction has taken place. Sometimes when a gas is formed as a product D (g), an arrow pointing up is written after the compound: D↑. 3. If water is formed from the neutralization reaction of an acid with a base. Heat Energy Change is noted by the test tube becoming warm (Exothermic). 4. A permanent color change is observed. In the next qualitative experiment, Case of the Six Powders, you will have to write all the reactions, predict the results using book references or solubility charts, then you will check into the laboratory, run a known to verify your predictions. Then you will attempt an unknown. In the third qualitative experiment, Case of the Six Liquids, your results will depend entirely on your ability to write and predict reaction products. You will NOT be allowed to test a known. You will attempt the unknown directly upon arrival. A KNOWN is a mixture of all the test IONS in this experiment. You will carefully follow the directions step by step. Record and observe the results on your data page. At the completion of the procedures you should know exactly what to expect from the reagents added if the ion is present. If during the unknown a different behavior is noted, like no reaction at all, then that ion is absent from your unknown. You will report the absence or presence of each of the four Cations in Part A and four Anions in Part B ions of this experiment. 1. For Part A, use your large rack of test tubes. Obtain from the reagent table 5 ml of the TEST SOLUTION (Known) which contain all 4 chemicals. BETWEEN YOUR FINGERS AS DEMONSTRATED BY YOUR INSTRUCTOR. 2. Now measure in your 25 ml graduated cylinder APPROXIMATELY 5 ml of hydrochloric acid (HCl). Use the technique demonstrated above so that you do not spill a drop of the acid on the table. IF YOU DO SPILL A DROP – USE A PAPER TOWEL FROM THE DISPENSER AT THE WASH SINK TO WIPE IT UP IMMEDIATELY. THROW AWAY THE TOWEL. IF ANY OF THE ACID GETS IN CONTACT WITH YOUR HANDS OR SKIN, WASH IMMEDIATELY USING LOTS OF WATER. 3. Pour the HCl into the test tube with the KNOWN. A white solid (precipitate) should form. HCl precipitates Silver, Lead, and Mercury ions only. 4. Using the technique in Figure 2 or that shown by your instructor, fold a piece of filter paper and insert in a funnel. FILTER the precipitate. Use a plastic squeeze bottle filled with deionized water and wash any remaining precipitate into the funnel. 5. Boil 10 ml of water. Just bring the water to boiling. DO NOT HEAT THE BOTTOM OF THE TEST TUBE. Heat the tube at the surface of the water, by tilting the tube at an angle. the Silver Chloride or Mercury Chloride precipitates left on the filter paper. 6. To the FILTRATE from Procedure #5, pour 2 ml of Potassium Chromate (K2CrO4). DO NOT ADD THE Potassium Chromate TO THE FILTER PAPER. IF THERE IS A PRECIPITATE. 7. Now pour 10 ml of Ammonium hydroxide (NH4OH) over the precipitate left on the filter paper in Procedure #5. COLLECT THE FILTRATE INTO A CLEAN TEST TUBE for the next step. If the precipitate turns black, MERCURY is present. If it stays white: MERCURY is ABSENT from the precipitate. 8. Tear off a piece of LITMUS PAPER (red or blue) about 1/4 in. long. Place in the FILTRATE from Step #7. It should turn blue or stay blue because of the excess hydroxide ion. This is known as a BASIC SOLUTION (those that test BLUE with Litmus). Basic solutions contain more hydroxide ions that hydrogen ions. 9. Now add nitric acid (HNO3) acetic acid and stir with a stirring rod (solid glass rod) till the litmus turns red. If the test tube fills and still tests basic with Litmus, stir well and pour off half the liquid into another test tube. Add nitric acid acetic acid until the litmus turns red (pink). At this point hydrogen ion concentration exceeds the hydroxide ion concentration and the solution is said to be acidic. litmus, SILVER is ABSENT from the solution. 10. Take the filtrate from Procedure #4; add a small piece of litmus paper. Neutralize the ACIDIC solution by adding ammonium hydroxide (NH4OH) dropwise until the solution turns the litmus blue. Add quickly several milliliters of NH4OH to start, then slow down to dropwise. Again if the solution fills the test tube, cut in half and continue the neutralization. 11. Filter the solution collecting the filtrate in a clean test tube. To the slightly basic filtrate, add 4 ml of Ammonium oxalate ((NH4)2C2O4). A white precipitate of calcium should appear if calcium is present. Spring 2009 Skip Steps #12 and #13 Potassium and Ammonium will not tested. Our seven flame wires are missing, so no Flame Tests may be done until a new set has been ordered. Also the lab is out of Nitric Acid, so Acetic acid will be used instead. 12. To the original unknown or known, perform a flame test for Potassium. A violet flash indicates Potassium. Remember you must clean the wire with acid before performing the test. If you cannot see the violet color, again use the evaporating dish, boil off the solvent. Heat the solution to almost dryness, and test the concentrated mixture for Potassium. Compare the Potassium color by obtaining a ml of Potassium nitrate and performing the flame test on it. 13. When doing this test, use fresh known or unknown solution. Obtain one ml of test solution. Place in an evaporating dish. Moisten a strip of red litmus paper. Attach to the underside of a watch glass. Obtain a pellet of sodium hydroxide (NaOH). DO NOT TOUCH OR SPILL NaOH SINCE IT IS VERY CAUSTIC AND WILL CAUSE A BURN. Place in the evaporating dish and place the watch glass over the dish. (The paper should be on the CONVEX side facing down towards the solution in the dish.) DO NOT BOIL! As the paper turns blue, wave your hand over the dish with the watch glass removed and try to detect the smell of ammonia gas (NH3). If the red litmus fails to change color, ammonium ion is absent from the solution. 14. Obtain in a clean test tube from the Instructor’s Desk an unknown which may contain any or all of the six four Cations. Record the Unknown Number on your Data Page. Repeat Steps #2 - #13 to verify the presence or absence of: LEAD, MERCURY, SILVER, CALCIUM, POTASSIUM, or AMMONIUM. Do not use all of your unknown in Step #3. Measure about 5 ml after you have stirred the unknown with your clean stirring rod. Test for K+ and NH4+ in step 12 and 13 by using the original unknown solution left. Return your unknown test tube with any remaining unknown to the front desk when you have completed the Unknown and your analysis has been verified by the instructor. NOTE: RECORD YOUR OBSERVATIONS ON YOUR DATA PAGE AND REPORT TO THE INSTRUCTOR WITH YOUR COMPLETE ANALYSIS WHEN YOU HAVE FINISHED STEP #14. Part B will be completed next week! 16. Add 2 drops of 6M-12M Sodium Hydroxide, NaOH - (concentrated solution) to your test solution, then add about 10 drops of Barium Nitrate [Ba(NO3)2]. A white precipitate should result. If a white precipitate does not form when testing the unknown, neither SO42- nor HPO41- nor CO32- is present. 17. Centrifuge the precipitate. Be certain to balance your test tube in the centrifuge with another test tube filled with equal amount of water, unless you are balanced by another student. BE CERTAIN TO MAKE NOTE OF THE NUMBER ON THE HOLE WHERE YOU PLACED YOUR TEST SOLUTION. Run the centrifuge for about 30 seconds. 18. 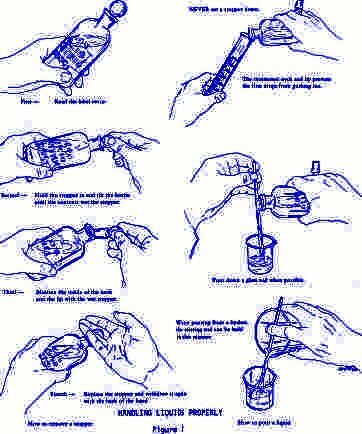 After centrifuging, test for complete precipitation by adding a drop of Ba(NO3)2 to the test tube. If cloudiness forms, add 3 more drops of Ba(NO3)2 and recentrifuge. Keep repeating this step until no cloudiness forms. Then after centrifuging, decant (pour off) the clear liquid into a clean test tube. This liquid is the centrifugate. The precipitate should be washed with about 1 ml of deionized water. 19. To the clear liquid from Step #18, add 6 M Nitric acid (HNO3), drop by drop until the solution is acidic to litmus. Do not insert the litmus paper. Use your stirring rod to stir and then touch the wet rod to the litmus. When acidic, the blue turns to red. Then add 2 drops of Silver Nitrate (AgNO3) and a white precipitate confirms the presence of CHLORIDE ION. No ppt indicates of absence of Cl- contamination. 20. To the white solid from Step #18, add 1 ml (about 20 drops) of 6 M Hydrochloric Acid (HCl). Look for immediate fizzing or bubbling. The formation of gaseous Carbon Dioxide confirms the presence of CARBONATE ION. If a precipitate remains after stirring, centrifuge and decant the clear liquid into a clean test tube. No fizzing indicates the ABSENCE of Carbonate. Another way to test for CO3-2 is to take a small sample of original test solution or unknown, add HCl and check for fizzing. 21. To the Precipitate from Step #20 add about half a test tube of deionized water to check to see if the precipitate dissolves. If it does not dissolve, the Sulfate ion, SO4-2, is present. Absence of a precipitate at the end of Step #20, or at this point, indicates the absence of Sulfate. 22. To the clear liquid from Step #20, add about 2 ml (20 drops) of Ammonium Molybdate ((NH4)2MoO4) solution. A yellow precipitate confirms the presence of PHOSPHATE, PO4-3. Absence of a yellow precipitate indicates the absence of phosphate. Since the yellow precipitate is sometimes slow in forming, the solution should be observed again after 5 or 10 minutes. 23. Obtain from the Stockroom in a clean test tube an Unknown Anion Solution which may contain any or all four of the test Anions. Repeat Procedures #16 through #22 using 20 drops of the unknown. Record your results and report to the instructor for a grade when you have made your analysis of the presence or absence of each of the anions: CHLORIDE, CARBONATE, SULFATE and PHOSPHATE.